Maybe this is a sign of aging. Maybe, at 29, I'm turning into a curmudgeon, perpetually disappointed by everything around me. On a recent Friday night, after closing down the laptop for the night after a day of work, I headed home for the evening, overwhelmed with the concept of actually having to cook something once I reached the kitchen door. A new Indian restaurant -- Nirvana -- recently opened in a Route 20 location in Guilderland that has changed hands and names so many times, I barely notice the shift anymore. But the parking lot was packed, I was hungry, and some version of a curry would be just fine. I placed an order on Mealeo (on Friday, give me as little interaction with other people as possible), sat in my car, and waited. (Well, I read a bit. And I took a catnap.) After 20 minutes I retrieved my order. $32 and change later, I walked out with an order of Navataran (vegetable) korma ($12.99), chicken tikka masala ($12.99), basmati rice and two orders of naan ($2.49 each). I didn't even have high hopes for the outcome and fulfillment gained from plopping down at home with mini-buffet of Indian delights ahead of me. You see, I've been lucky enough to Indian food on multiple continents, but the closest I'll ever get to true Indian cuisine is watching Eat, Pray, Love for a second (okay... fifteenth) time. 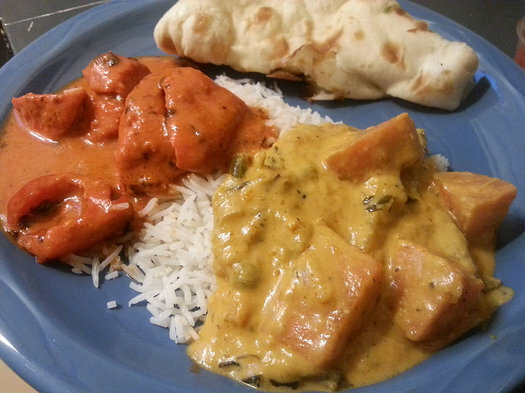 Somehow Indian food is rarely what I think it should be. But wait - what was that I tasted? A bit of hope on an aimless Friday night? Indeed it was. After feeling a bit regretful that perhaps I had ordered far too much food to consume alone (Nirvana threw in an order of papadums with assorted chutneys and tamarind sauce), the sights and smells were enticing. I couldn't wait to dig in. The naan, placed in an insulated takeout bag, had only just begun to steam and lose its crispy charred exterior. Not enough to make it limp and sad, but just the right texture to sop-up leftover sauces and bits of rice. Thick and chewy, it was my perfect version of naan. The highlight, for me, was that korma. It reminded me of a chunky, vegetable-laden version of butternut bisque. The heat level was mild, but the array of spices that danced throughout, artfully combined and masterfully measured, made this korma the best I've tasted this side of the Atlantic. The highlight, for me, was that korma. It reminded me of a chunky, vegetable-laden version of butternut bisque. The heat level was mild, but the array of spices that danced throughout, artfully combined and masterfully measured, made this korma the best I've tasted this side of the Atlantic. The sauce was thin enough to keep it from being cloying but rich enough to coat the yams, peas, potatoes, and onions that bobbed in a sea of subcontinental flavor. 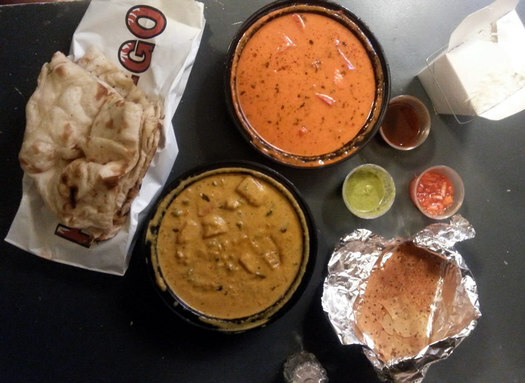 With good takeout, maybe all is not lost on Friday nights. Nirvana offered me that glimmer of hope after a trying week. And the best part? There was enough left over on Saturday morning to serve alongside a fried egg or two. Food looks, and sounds delicious. My problem is that i have acid reflux,and worry about things that are too hot, or spicy? My recent scary bouts with almost passinging my sleep because of Silver Palette tomato sauce, choc-choc chip ice cream made me cautious. Can i eat any of your deicious expeience? And call me when you do takeout so I can make sure you don't choke on the chicken, and we'll have more things to taste. They do really good dhosa. If I hadn't just stuffed myself with half a Sovrana Supreme Hero I'd be on my way out there right now.